The word ‘paradise’ comes from the ancient Persian word pairidaeza – the Persians being one of the earliest peoples to cultivate gardens, parks and hunting grounds. Petri means around and deaza means wall, thus the word suggests an area isolated from its surroundings, enclosed by walls. From early on in the Jewish and Christian traditions “paradise” became associated with the Garden of Eden. Thus by the time of the Prophet Muhammad the Gardens of Paradise promised to the righteous were not a new concept. Indeed the pre-Islamic Arabs considered the slightest indication of nature’s greenness to be sacred. Since they were completely dependent on the oases for their survival it was natural that they should love and revere nature’s vegetation, both for its physical benefits and as a sign of the mysterious power that guided the universe. There are over one hundred and twenty references to the “Gardens” in the Qur’an, the phrase most commonly used being jannat al firdaws, meaning gardens (jannat) of paradise (ßrdaws). The range of epithets used with jannat indicates a place not only blissful and eternal, but also a refuge, a sheltered and secure retreat (khalwa). The term “Gardens of Eden” suggests the spiritual peace and harmony of man’s primordial state. Gardens of Eternity, Delight Bliss, Refuge, as well as Eden all recur several times, but the phrase most often used (over thirty times) is Jannat tajri min tahtiha al-anhar, “Gardens underneath which rivers flow”.3 On one level this evokes the literal image of water flowing under the pathways in order to irrigate the flowerbeds, but on a more profound level it suggests the nurturing of the ‘garden within’ by the ever-flowing waters of the spirit which purify the soul. Indeed, water is symbolic of the soul in many sacred traditions, reflecting the soul’s ability to renew itself while remaining true to its source. The endlessly flowing, splashing and trickling water in the gardens of the Generalife at the Alhambra, as well as in the Alhambra palaces, is certainly one of the most evocative representations of the Gardens of Paradise anywhere in the world. The number four contains a universal symbolism reflecting the order of the universe – the four cardinal directions and the four elements. 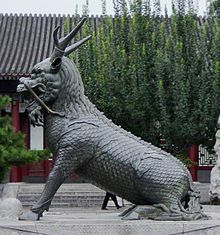 Islam invested this ancient symbolism with a rigorous spiritual vision. The Ka’ba, literally ‘cube’, sums up this symbolism perfectly. To Muslims it not only represents the house of God (Bayt Allah) but also the centre of the world, its shape emphasizing the solidity of the earth and the four directions. The circumambularion of the Ka’ba, part of the rites of the pilgrimage, is the circle enclosing the square, the meeting place of heaven and earth. There are, of course, other types of Islamic Garden, among them the gulistan, meaning rose garden, bustan, formal garden, kitchen-garden or orchard and bagh, the most general allembracing term. Here, though, we are specifically concerned with the chaharbagh, a Persian word literally meaning “four gardens”. It came to mean a garden divided into four quarters (sometimes each quarter also divided) by water-channels or pathways, usually with a fountain or pool at the centre. The layout of any of the famous Islamic Gardens is based on the number [our. In India, for example, the Anguri Bagh in Agra (part of the Red Fort) and the Taj Mahal, are both centred on a four-fold design. This design is based on the interaction of the circle and the square,7 symbolising the heavenly and earthly worlds. The chahar-bagh can thus be seen as a kind of open-air sacred architecture, analogous to the traditional ArabIslamic house which is built on a four-fold plan around a central courtyard. Integral to the Muslim idea of a paradise garden on earth is that it is a private place, hidden away from the world and from people, a place for prayer and contemplation. In the same way the privacy of the courtyard house corresponds to the private interior world of the family. In Persia, as well as in the Arab countries and in India, gardens and courtyards were clearly defined spaces within the layout of the architecture; dust was kept outside the inclosing walls and shade and cool were kept within. The courtyard is itself a kind of paradise garden in miniature since it represents the inward, contemplative aspect of man. The garden in Islam also serves as a reminder of both the immanence and the transcendence of God. The great love and knowledge of plants, flowers and trees in, for instance, Islamic Spain and Mughal India, was a love born of the deep belief that the beauty of nature was a reflection of a transcendent truth; these plants and flowers are the shadow of their heavenly archetypes, their beauty a radiation of God’s glory on earth. 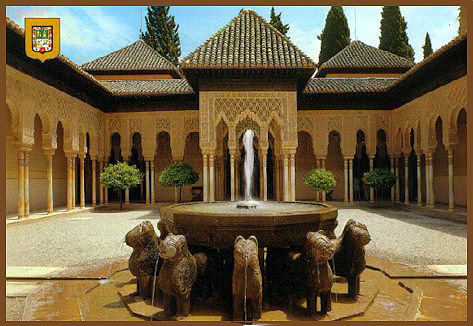 Water – cooling, cleansing and purifying – is at the centre of the garden, the courtyard and the mosque. 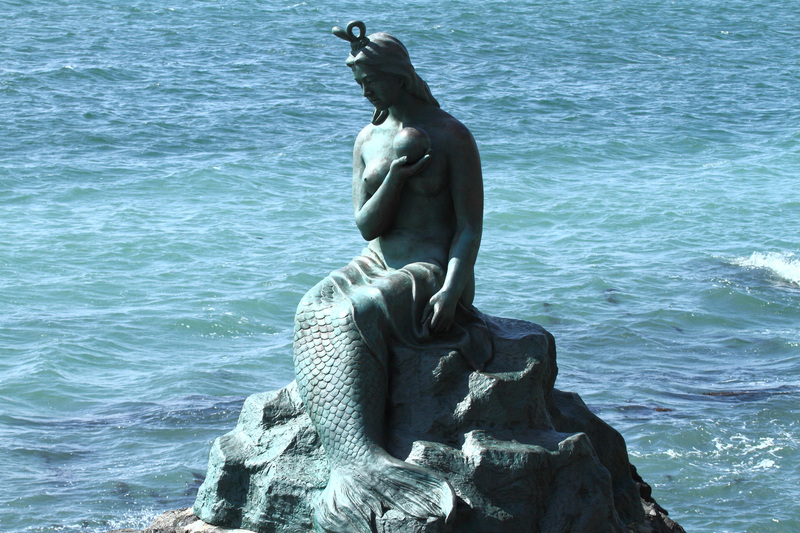 In a traditional society there is no separation between the sacred and the profane and water is the supreme example of this, reminding us that man is at once body, soul and spirit, and that the outward habits by which we live cannot be disassociated from the inward. Thus, in the courtyard garden, the miniature chahar-bagh, the indispensable element was not the vegetation – the trees, plants and flowers, often omitted altogether because of lack of space – but water. At the Alhambra in Granada, Spain, the longest lasting of the Moorish kingdoms, the Nasrid dynasty created a series of exquisite courtyards, in the centre of which water is always present in some form or another: in the Court of Myrtles there is a large still pool bordered with myrtle hedges, while in the Court of Lions an elaborate fountain has water constantly flowing. 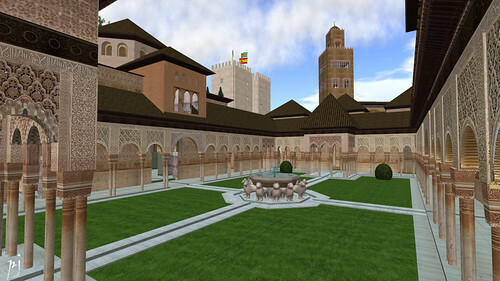 The gardens that extend from the courtyard of the Alham bra are themselves a series of courtyards, formed not by the stone walls of the palaces or other buildings but by hedges and trees, creating secluded areas. It is in the nature of paradise to be hidden and secret since it corres- ponds to the interior world, the inner- most soul – al-jannah – means not only ‘garden’ but ‘concealment’.8 The gardens show great attention to geometric design, for instance, a fountain is surrounded by a hexagon formed by low box hedges, and straight pathways are bordered with cypresses leading into courtyards with fountains in the centre. 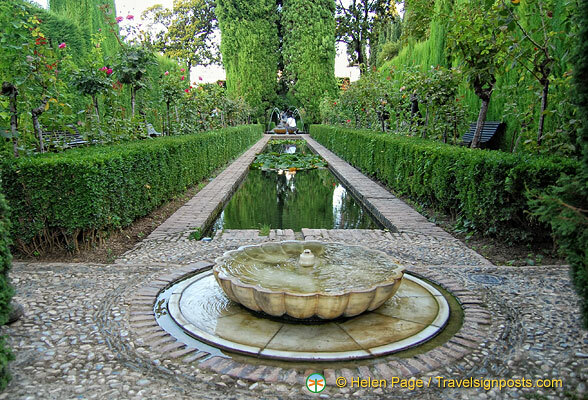 The jewel at the heart of the Generalife is the Patio de la Acequia, literally Patio of the Aqueduct This garden, high up on the side of the hill, is approached by walking up some small, dark, covered steps and appears quite suddenly – truly a “vision of paradise”. Sitting in this garden for any length of time, slowly absorbing its beauty, the visitor finds that the sound of the water gradually drowns out all preoccupations of the mind and an overwhelming sense of tranquillity descends. It is important to remember the stark contrast between the harsh and arid landscape in most parts of the Islamic World and the gentle cool given by trees and the foliage of a garden. Green is the colour of Islam and the colour most often mentioned in the Qur’anic descriptions of paradise. Flowers and their bright array of colours are of course a vital element in Islamic art, such as tiles, miniatures and textiles, but in the Qur’an it is running water, trees and the colour green that are mentioned most often. The fountain in the centre of the garden or courtyard, representing one of the fountains in paradise, is often set within an octagon. The octagon is the transitional geometric form between the circle, representing heaven, and the square representing earth; frequently, the dome of a mosque is supported by an octagonal drum – the gateway, as it were, between earth and heaven.9 The pavilions at the four corners of many Mughal mausoleums including the Taj Mahal, are octagonal and the throne of God is supported by eight angels, signifying the renewed man after he has travelled through the seven heavens and regained paradise. So the number eight became associated with paradise; the Persians, in particular, created palaces and gardens called HashtBehesht or Eight Paradises – the one remaining palacegarden on the Chahar Bagh Avenue in Isfahan is called the “Hasht Behesht”. The same was true of the Mughals. Babur, the first Mughal emperor, records in his memoirs in 1519 “Humayum arrived and waited on me in the garden of the Eight Paradises”.10 Sa’di divided his poem “Gulistan” into eight parts, each part corresponding to one of the eight paradises. There were often high walls with grand gateways as entrances into the gardens, sometimes one in the centre of each wall. The gateway is associated with the mihrab, the arched niche that indicates the qibla in the wall of a mosque and provides the defining motif of the prayer carpet. One of the fundamental meanings of both the gateway and the mihrab is that they represent the entrance to the celestial world, the heavenly gardens. The basic chahar-bagh plan was subdivided into four plots and then into four further plots, a modular arrangement reflected in the composition of most garden-carpets. Light and water are constant metaphors – the channels of water from the central fountain or pool were constructed so that the pool was always overflowing, like the eternally-flowing waters in the Gardens of Paradise. Very often the channels were lined with dark blue or green tiles set at angles so that the water flowing over them would break up, causing ripples on the surface to catch the sunlight the water and the light together dissolving into an array of sparkling diamonds. Such devices soften the ordered and geometric nature of the garden, as does the vegetation it contains – the generous planting of chenartrees (the plane tree, platanus orientalis) with their large, shade-giving leaves, and the cypress, the palm-tree and the olive as well as the different kinds of fruit trees: fig, cherry, peach, citrus, pomegranate, and almond, with their abundant blossom and fruit Flower-beds were most likely to be filled with fragrant varieties such as jasmine, roses, narcissi, violets and lilies. “Serried acacias, palms and vines” are mentioned in the Qur’an (2:268), and other trees to be found in Islamic gardens were the willow, bay, juniper, myrtle and laurel. While the cypress represented eternity and the male principle, the flowering fruit tree represented spring, the female principle and the renewal of life. The two are depicted many times in both Persian and Mughal miniatures, the branches of the fruit tree curling around the cypress tree, symbolic of both the entwining of the lovers and the union of the heavenly eternal world with the earthly changing world. Across the Islamic world, particularly in North Africa, brightly coloured bougainvillea blossom can be seen growing up the dark majestic cypress. Persian poetry abounds with images of the garden and the constant interplay between symbol and archetype, the earthly and the divine. Firdawsi, Hafiz, Sa’di and Shabistari are just a few of the poets who used the image of the garden to capture the essence of the Qur’anic paradise or to portray the beloved. The chahar-bagh became the principal symbol of the Qur’anic paradise on earth and it was taken up and developed in most parts of the Islamic world, from Moorish Spain and North Africa to Syria and Mughal India. Islam invested the ancient Persian prototype with a whole new spiritual vision and Divine archetype, and it is fundamentally upon this Divine archetype that the chahar-baghs are founded. Centred on a spiritual vision of the cosmos, these gardens on earth mirrors of their Heavenly counterparts – aim, like all sacred art to draw the visitor closer to God. Understanding something of the source of their inspiration can be of great value in creating gardens today in the western world. As is well known, never before in the history of mankind have there been such enormous and densely populated urban areas as there are today; and never before has there been such an intense desire to escape these areas – usually through travel to remote places “untouched” by man but also, on a smaller scale, through creating gardens. These gardens are not only beautiful to behold and places of quiet but are also (often unconsciously) a recreation of the Heavenly garden, itself reflected within all of us – our inner garden: “Look for the garden within yourself, in your indestructible divine Substance, which will then give you a new and imperishable garden”.